This line, taken from Riggan’s stage adaption of Raymond Carver’s What We Talk About When We Talk About Love, is repeated throughout Birdman’s runtime and is somewhat the crux of the film, in a way, sort of, as much as anything could be the crux of a film as long and as baffling and as riddling as this. We’re often faced within the dialogue (which is in itself somewhat Carver-esque) by speeches and one-liners regarding validation, and what constitutes validation, and why we even seek validation for our existence in the first place, and what is art anyway, and are you ever truly an artist if you have a goal beyond the process, and what’s truly the role of a critic in terms of an artist—is there any role for the critic at all? WHAT IS SAID ABOUT THE THING IS NOT THE THING. These words are some of the first we read on-screen, and they’re on a piece of card taped to Michael Keating’s dressing mirror. These words are staring him in the face. Are they a belief or a reminder? At different times in the film I thought both of these things. I thought many things about ex-blockbuster superstar Riggan ‘Birdman’ Thomson. I felt many things about him too, and I watched as the brilliant and flowing camerawork led me around the theatre and in turn the lives of he and his coworkers. There’s a density to this film. It’s a long film, though it doesn’t feel it. It’s a film that doesn’t waste a word. It’s a film that’s so meta Edward Norton’s Mike Pierce can walk on stage and in the same conversation talk about celebrity Meg Ryan and about how a script ought to be cut down to absolute simplicity. His advice imitates Carver’s. Life imitates art imitates life imitates art. This film has a lot of layers is what I’m saying. The Unexpected Virtue of Ignorance. The folly of the artist. The folly of man. A society that has blurred the lines between performance and reality and entertained itself into catatonia. I don’t know what this film is about, but I know that everything meant something, and that all of director Alejandro Iñárritu's choices were deliberate. 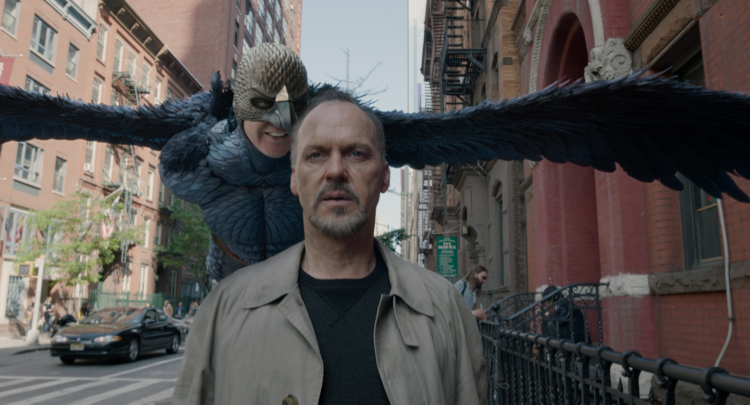 To create a character piece with so many delicate, simple vignettes and then to turn all at once and make statements about the nature of modern art while wrestling with the eternal question of the artist’s role, while also forcing the audience to ask themselves—is Birdman real? Do I want Birdman to be real? Part of me didn’t really want to review this film initially. Riggan makes such a convincing case against the reviewer character in this film that I just wanted to post the cover image of this review and let it be. But I realised of course that a film is not its characters, and that what is said by one individual is not the overarching message of anything, and that maybe there isn’t a message here but a sentiment. That the discussion of modern art—WHAT IS SAID ABOUT THE THING—while not being the thing, could maybe be as important as the thing, whether the thing likes it or not. And maybe we’re all living our lives behind cellphones, and maybe artists really are just pretentious wanks, and maybe nothing really does matter more than a viral tweet, or a LiveLeak video, or a three-hour-long and delicately crafted play. Birdman doesn’t really take sides in regards to any of these things. The film shows us people, and those people, like any people, aren’t consistently on one side or another. They do not have a holistic view of the world, just as you or I do not. What they have are feelings, and hearts, and motivations. Important, beautiful motivations. Every character wondering around this bizarre and beautiful masterpiece, followed by that unbreaking, ever-flowing camera, and the unforgettable percussion score—every character looking to answer a question.